Choose sides in the battle at Cylarne to relight the hope of New Sheoth. Receive your assignment from Sheogorath. Fight in the Battle for Cylarne. Light the Flame of Agnon. 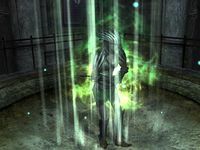 After completing The Lady of Paranoia and Addiction, thereby completing Understanding Madness, Sheogorath tasks you with relighting the Great Torch, in order to calm the citizens of New Sheoth. Travel to Cylarne and speak with both the Golden Saint and Dark Seducer sentries. You are required to choose whether to help Mania's Golden Saints or Dementia's Dark Seducers to relight the Flame of Agnon. The basic idea behind the Battle Plans for Cylarne is to position the Dark Seducers in one of either two locations, the Main Passage or the Underdeep and inducing the Golden Saints to attack through one of these locations. Talk to either Ulfri of the Dark Seducers or Kaneh of the Golden Saints. Regardless of whom you choose, both commanders will request that you scout out the other's position. You will soon learn of the Saints' intentions to attack through the Main Passage, and that the Seducers have positioned the bulk of their forces within the Main Passage. No matter which scenario you choose, the Seducers are always on the defense. This gives them the advantage of terrain and the ability to concentrate a large number of Seducers against Saints who will attack in waves rather than a coordinated mass. Therefore the scenarios you choose to favor the Seducers will pit both forces in a head-on confrontation: the Seducers stand in defense exactly where the Saints make their attack. The Road of Honesty: Essentially, you let the commanders of both sides carry out their original plans: the Saints attack down the Main Passage, while the Seducers defend that Passage. Inform the Seducer commander Ulfri you choose to side with her, and the Saints will attack as expected. The Road of Treachery: The most underhanded of any scenario, you will reposition the Seducers into the Underdeep, then convince the Saints commander that a sneak attack through the Underdeep is the way to go. You will lead the Saints straight into an ambush, where the Seducers can make use of the Underdeep's dart-traps to aid in their slaughter of the Saints. As confident as the Golden Saints may be of their strength, the best means to defeat the Dark Seducers is to take the Altar of Despair with little opposition, then slaughter the Seducers from this unexpected direction. The scenarios you may choose to favor the Saints have them bypass the Seducers' strongpoint of defense and strike them down with a surprise attack. The Road of Strategy: You must convince the Golden Saints' commander Kaneh that Mirel's scouting report is true and that the Underdeep has only a token defense. This should provide no trouble in taking the Altar of Despair and defeating the Seducers with a surprise blow from behind. The Road of Guile: You will want to place the Seducers out of position, so convince their commander to redeploy her soldiers into the Underdeep to anticipate a surprise attack by the Saints. Then inform the Saints' commander Kaneh to make her attack through the Main Passage as planned. The Main Passage, stripped of its defense, provides the road by which the Saints will launch their surprise attack... just not the exact one that the Seducers were expecting the Saints to make. The Road of Courage: The third and most difficult option is to make a straightforward attack against the Seducers in the Main Passage. Tell Kaneh that you're ready to attack now, and you'll accompany the Saints as she executes her plan. It is possible to defeat the Seducers directly, but you will first have to weather some ranged attacks by the Seducers situated above during the opening stage of the battle. Once battle is joined, you will be first tasked to kill the opposing commander. After she is slain, assist your chosen army in finishing off the enemy survivors. When the battle is over, the commander of your army will ask you to accompany her to the Altar of Despair. There she will inform you of what is required to light the Flame, and that the Altar of Rapture has already been lit by a subordinate. She will then step into the Altar of Despair and sacrifice herself to ignite the flame. Return to the Cylarne Courtyard, where the Flame of Agnon is now burning. Step into the Brazier to claim the Flame. Return to New Sheoth and proceed to the Sacellum Arden-Sul. Talk with both priests, Dervenin and Arctus, and choose whether to light the Flame for either Mania or Dementia. Each choice will yield a different reward. If you choose to light the flame for Mania, Dervenin will reward you with the Raiment of Arden-Sul. The raiment is a clothing item with Resist Paralysis, Shield, Fortify Intelligence and Fortify Willpower enchantments. If you choose to light the flame for Dementia, Arctus will reward you with the Raiment of Intrigue. This raiment is a clothing item which provides a fortification bonus to Speed, Security, Sneak and Luck. Activating the altar once it is lit will bestow a blessing upon you, either the Flame of Mania or Flame of Dementia. The Dementia priest, Arctus, claims you that you will be awarded the "Ring of Intrigue" if you light the torch for Dementia. You are in fact given a "Raiment of Intrigue" rather than a ring. Upon successfully completing the quest, a trophy of either Ulfri or Kaneh's Helmet will appear in an alcove in Sheogorath's Palace. Killing one of the commanders can start the Dark Brotherhood quest line. An achievement will be unlocked upon lighting the Great Torch. The quest may fail to update when Ulfri or Kaneh sacrifice themselves on the altar. ? This can be fixed with the console command setstage se06 170 (if supporting the Golden Saints) or setstage se06 175 (if supporting the Dark Seducers). If you attack a Golden Saint or Dark Seducer inside Cylarne, they may pursue you back to Cyrodiil. ? If you fast-travel to New Sheoth after taking the Flame but before the quest updates, the priests at the Sacellum will not have the topic about lighting the Flame for Mania or Dementia. ? Fast-traveling back to Cylarne will trigger the update, allowing the quest to proceed normally. 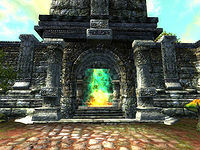 Arctus or Dervenin may get stuck outside the gates to the Shivering Isles in Cyrodiil. If this happens, you will be unable to complete their respective quests. ? If you return to Cylarne and step in the fire again after completing the quest, you will be covered in flames that will not disappear. ? 8 Sheogorath wants me to relight the Great Torch of New Sheoth. I need to go to the ruins of Cylarne, kindle the Flame of Agnon there, and return with its holy fire. Sheogorath warned me that the Golden Saints and Dark Seducers who guard the shrine often fight each other, so I should proceed cautiously. 9 I have arrived at the ruins of Cylarne. I will need to speak to the commanders of the Golden Saints and Dark Seducers to find out how to light the Flame of Agnon. I should speak to Ulfri, the Dark Seducer commander, about kindling the Flame of Agnon. I should speak to Kaneh, the Golden Saint commander, about kindling the Flame of Agnon. 30 I overheard two Golden Saint officers arguing about the best way to attack the Dark Seducers. The lieutenant, Mirel, mentioned something about the Underdeep, a secret side passage leading to the Dark Seducer altar. I should find out more about this passage from Mirel. Mirel, the Golden Saint lieutenant, told me that his scouts have recently discovered a side passage leading to the Altar of Despair through the Underdeep. He believes an attack down this route will take the Dark Seducers by surprise. I should scout the Dark Seducer deployments in both the side passage and the main passage and find out if Mirel is right. The Dark Seducers are defending the main passage to the Altar of Despair in strength. The Underdeep, by contrast, appears to be only lightly defended. This information might convince Kaneh to attack through the Underdeep. The Dark Seducers are defending the main passage to the Altar of Despair in strength. The route through the Underdeep appears to be only lightly defended. This information might convince Kaneh to attack through the Underdeep. I spoke with Kaneh, the commander of the Golden Saints in Cylarne. She is preparing to assault the altar controlled by the Dark Seducers, and believes that with my help, they could finally drive the Seducers out of Cylarne. Once she controls both altars, she will be glad to light the Flame of Agnon for me. Both commanders have promised to light the Flame of Agnon for me if I help them defeat their rivals. Now I need to decide which side I will help, and how. 45 I told Kaneh that I would scout the Dark Seducer positions and report back to her. I should check their deployments in both the main passage and the Underdeep, so that I can recommend the best way to assault the Altar of Despair. I convinced Kaneh to attack through the Underdeep. Ulfri will be pleased when I lead the Golden Saints into her trap. I should help destroy the Golden Saints once the Dark Seducers spring their ambush. I spoke with Ulfri, the commander of the Dark Seducers in Cylarne. She is preparing to defend her position against a Golden Saint attack, and promised that if I help her destroy the Golden Saints, she will light the Flame of Agnon for me. 65 I told Ulfri that I would try to find out the Golden Saints' attack plans, and then report back to her. She suggested that I speak to Kaneh, the Saints' commander, who should be at their main encampment at the Altar of Rapture. 70 I agreed to help Ulfri defeat the Golden Saints. Her scouts report that the Saints have launched their attack. I should follow Ulfri and help her destroy the Golden Saints. 75 I told Ulfri that I could lead the Golden Saints into an ambush if she redeployed her troops into the Underdeep. She agreed to my plan. Now I must return to Kaneh and decide who I want to betray. The Dark Seducer commander is dead. I should finish off the remaining Dark Seducers in Cylarne to complete the Golden Saints' victory. 124 Kaneh wants me to open a gate that is blocking the progress of the Golden Saints' attack. She and her troops will hold their position until I find a way to open the gate. 125 I've opened the gate. The Golden Saints can now continue their attack. I should accompany them and help them destroy the rest of the Dark Seducers in Cylarne. 130 The Golden Saints in Cylarne have been utterly destroyed. I should speak to Ulfri about lighting the Flame of Agnon now that her forces control both of the altars. 140 The Dark Seducers in Cylarne have been utterly destroyed. I should speak to Kaneh about lighting the Flame of Agnon now that her forces control both of the altars. Ulfri thanked me for my help in securing Cylarne for the Dark Seducers. She is now heading for the Altar of Despair, where she says she will "sacrifice herself" to kindle the Flame of Agnon. I should accompany her and see what happens. 170 Kaneh sacrificed herself on the Altar of Despair in order to light the Flame of Agnon. I can now retrieve the Flame from the courtyard and bring it back to New Sheoth as Sheogorath commanded. 175 Ulfri sacrificed herself on the Altar of Despair in order to light the Flame of Agnon. I can now retrieve the Flame from the courtyard and bring it back to New Sheoth as Sheogorath commanded. 190 I stepped into the Flame of Agnon and am now ablaze with the holy fire. I should return to New Sheoth and light the Great Torch in the Sacellum Arden-Sul. It is possible to use the console to advance through the quest by entering setstage SE06 stage, where stage is the number of the stage you wish to complete. It is not possible to un-complete (i.e. go back) quest stages. See SetStage for more information. This page was last modified on 24 October 2018, at 06:33.